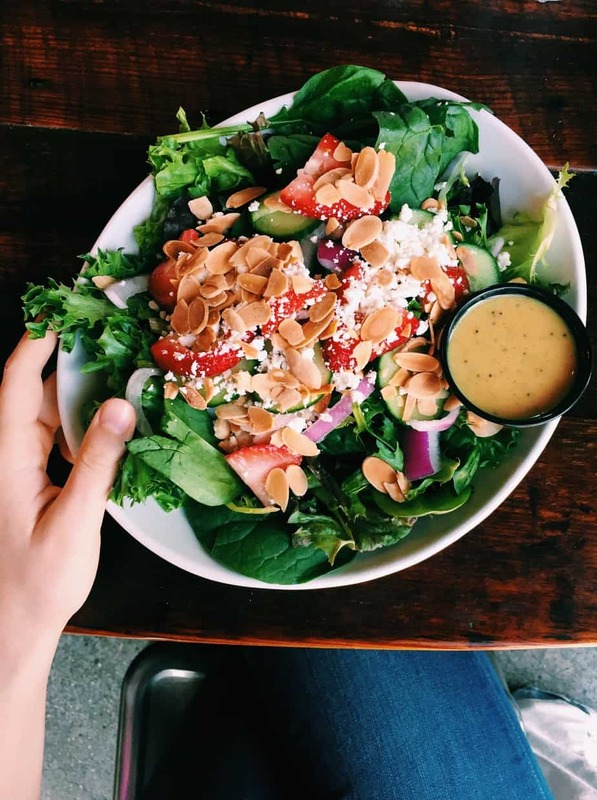 Greater Lansing Gluten Free Guide: Restaurants and More! 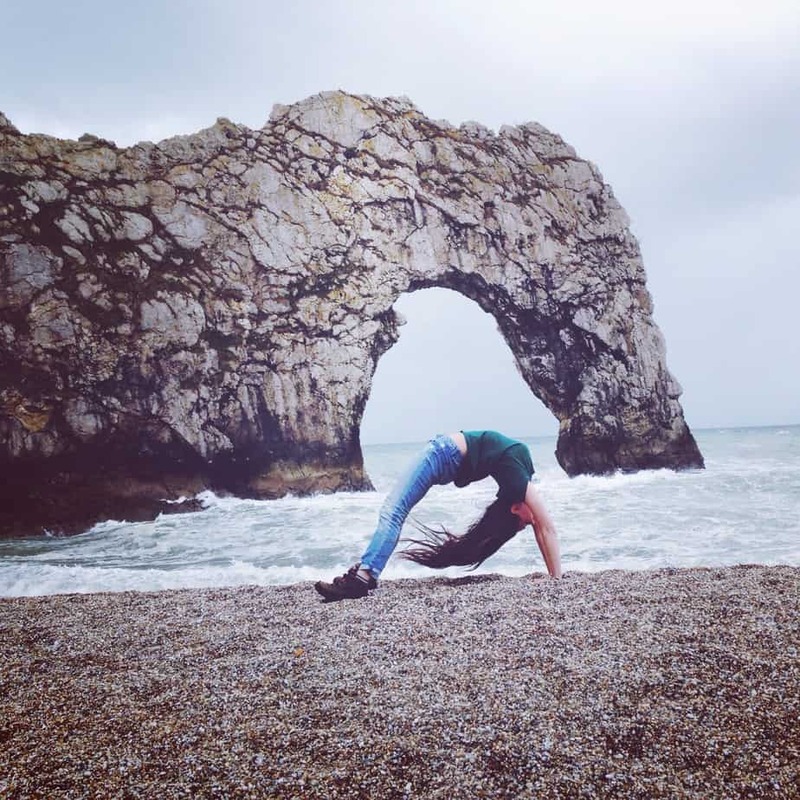 Today I’m bringing you not just any gluten free travel guide, but my most researched one ever! You could say I’ve been researching it my whole life 😉 Jokes, but today I am telling you all the best greater Lansing gluten free restaurants. I grew up in Lansing so I have had years of doing my own research! I also recently went on a press trip hosted by the Greater Lansing Convention & Visitors Bureau, who showed me even more gluten free restaurants in Lansing. And finally, I managed to pick the brains of my new Dietitian, who gave me an entire book about her recommended Lansing gluten free restaurants! a yummy salad from Lansing Brewing Co! A word before we begin – If you are visiting Lansing, you may know that this is Michigan’s capital city! However, it is also a metropolitan area (that’s where the “greater” comes in) covering three counties. I’ll be sharing mostly gluten free finds central to Lansing city, but there are some a bit further out in the metropolitan area that are just so good I can’t leave out! Related: Things to do in Lansing Michigan: Touring my Hometown! This is my favorite restaurant in the Greater Lansing area for reliable gluten free meals. I worked here for one summer but it was my favorite restaurant even before that… when I applied for my job they referred to me as “gluten free girl” haha. Red Haven makes gourmet food with unusual combinations in a tapas style. ALL ingredients are locally sourced! They do not have a separate gluten free menu because their menu changes every few weeks… but they always have gluten free options. Just ask you waiter/waitress who will provide a marked menu for you. 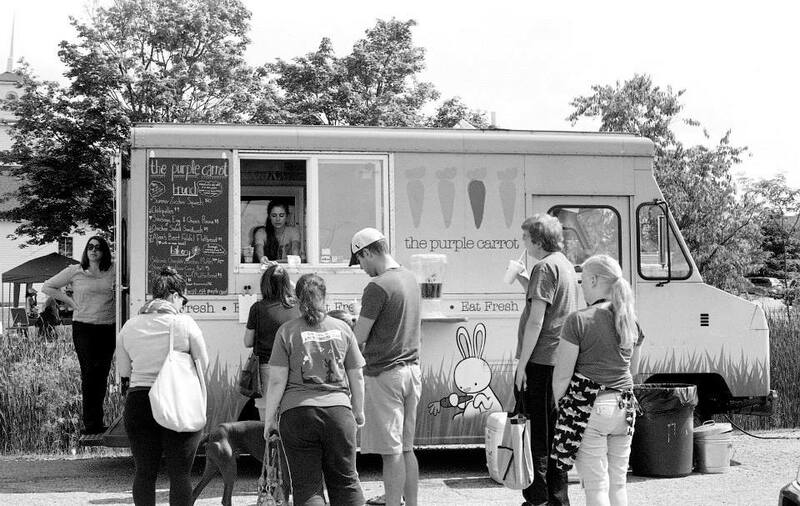 Also check out Red Haven’s associated food truck, the Purple Carrot Truck, which brings their yummy gluten free meals on the road. It was even featured on Diners, Drive ins, and Dives! a film photo circa 2015… my friend Essie took this of me working in the purple carrot truck! Yum yum. This is a sushi restaurant with a location in Okemos and a location in East Lansing. The sushi is incredibly well-made and tasty, and they serve cocktails too…they even have a sushi brunch! Maru carries gluten free soy sauce. Sansu is your other stop for high quality sushi in East Lansing. Their rolls are bigger than Maru’s, which means more sushi but also they hold together worse. Sansu has a special area where you sit on the floor which is fun. They carry gluten free soy sauce. Envie is a contemporary French bistro located walking distance from the capital building in downtown Lansing. They have a long menu with lots of gluten free options (ask the waiter for the marked menu, there is no separate gluten free menu). 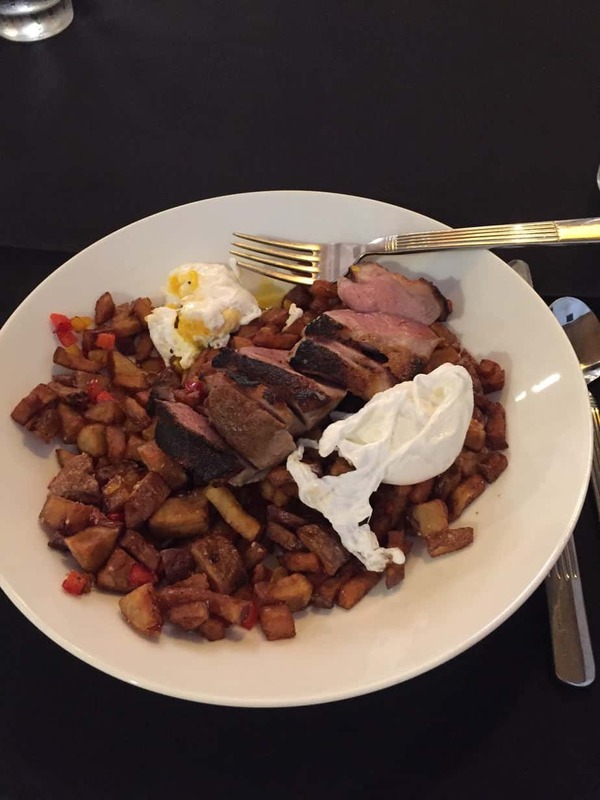 I had the special when we went, a roasted duck Benedict with roasted vegetables. It was soooo good! Tavern 109 is located in the small town of Williamston, east of Lansing. It is in a rustic-looking building that is a repurposed bank! Tavern 109 has a separate gluten free menu with tons of options. 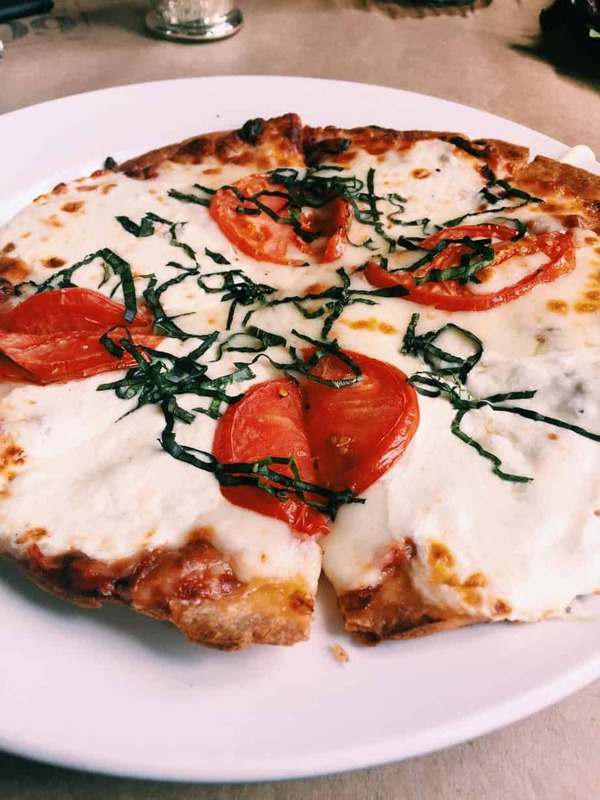 I tried the cauliflower crust margarita pizza which I was so impressed by. It was the first cauliflower crust pizza I’ve ever had that actually tasted like normal pizza! This is such a wonderful breakfast option for anyone looking for a gluten free breakfast in the Greater Lansing area! Here you can find gluten free waffles and gluten free pancakes (and a separate gluten free menu)!! How excited for us celiacs and gluten intolerants. This is ONLY at the DeWitt location of the Flapjack shack. You can read an in-depth blog post by fellow gluten free blogger Margaret here. I have a special place in my heart for boutique coffee shops and cafes. Lansing is definitely entering this scene with two new coffee shops opened within the last year. Both serve gluten free pastries! There are two locations, both in Lansing, for this minimalist yet aesthetically pleasing coffee shop. Bonus, they carry GLUTEN FREE DONUTS!!! I recommend getting a blueberry glazed gluten free donut, paired with an iced NOLA coffee. If you live in the Lansing area, keep up with the Strange Matter Facebook page as they host lots of events! Blue Owl is located in the up and coming Reotown neighborhood of Lansing. 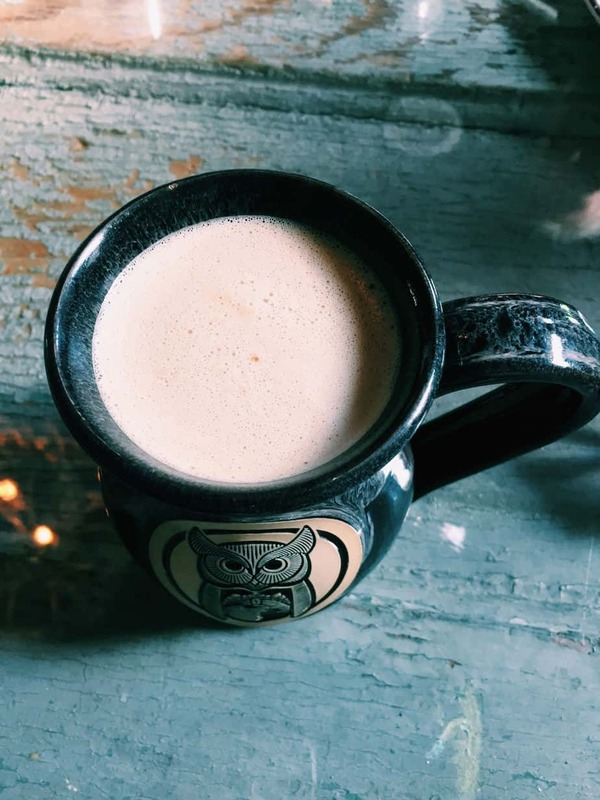 It is beautifully decorated and the specialty pottery mugs make my heart pitter patter. Grab one of their specialty “nitro” coffees, which are brewed like beer! After messaging with the management, I can confirm Blue Owl carries gluten free pastries and granola bars, although make sure you get there early before they sell out. If you live in the Lansing area, keep up with the Blue Owl Facebook page for events! 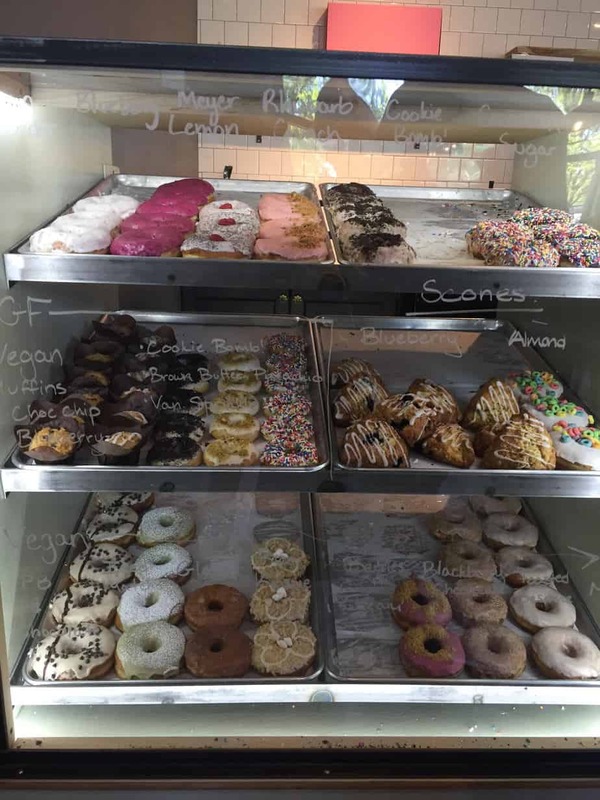 Glazed and Confused is a new bakery in the Lansing area offering gluten free pastries and donuts! (Can you tell I have a thing for donuts?). They recommend calling the day ahead if you plan to visit so they can make sure the gluten free donuts are fresh. A lovely Michigan franchise serving pies, salads, and sandwiches. They carry gluten free bread and can make any sandwich gluten free. They usually have gluten free desert options out on the counter, such as gluten free cookies and brownies. 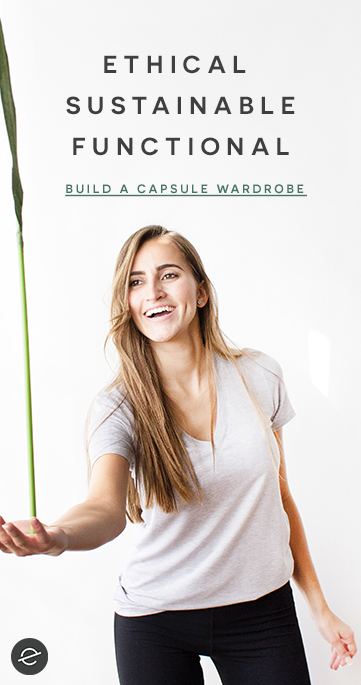 There are locations in Lansing, East Lansing, and Okemos. Jersey Mike’s is your one stop shop in Lansing for sub sandwiches… on gluten free bread! This is truly a treat, especially for a chain restaurant. Check out the more in-depth review of Jersey Mike’s gluten free sub safety practices here. Cottage Inn has multiple locations across the Lansing area (downtown and metropolitan). They have a MASSIVE gluten free menu and are my family’s go to place to order takeout pizza! In fact, I am writing this blog post after having a gluten free pizza and garlic bread dinner from Cottage Inn 🙂 Check out their entire gluten free menu here. Culver’s is a chain restaurant specializing in burgers and custard. They are fast food but I would say a step above places like McDonalds or Burger King. At Culver’s you can not only have fries cooked in a separate fryer, but also gluten free buns!! Yes, a fast food place with individually packaged gluten free buns…. I swoon. This is a well known chain restaurant themed on a classic American diner. You can find breakfast at Denny’s 24 hours a day! Their menu marks all gluten free items. Notably, the sausages are gluten free and they even have gluten free english muffins. Check with your server about cross contamination practices at your specific location. Thank you to my dietitian for providing the above list! The MI Gluten Free Gal blog… with useful tips for celiac and gluten intolerants all over Michigan! Sparrow dietitians. I see a dietitian at Sparrow hospital and I know that many others in the area who are either celiac or gluten intolerant have had very good experiences here. If you live in the Lansing area and feel like you’re struggling maintaining your gluten free diet, see if you can get a referral to Sparrow. I hope this was helpful for any locals or visitors to the Greater Lansing area! 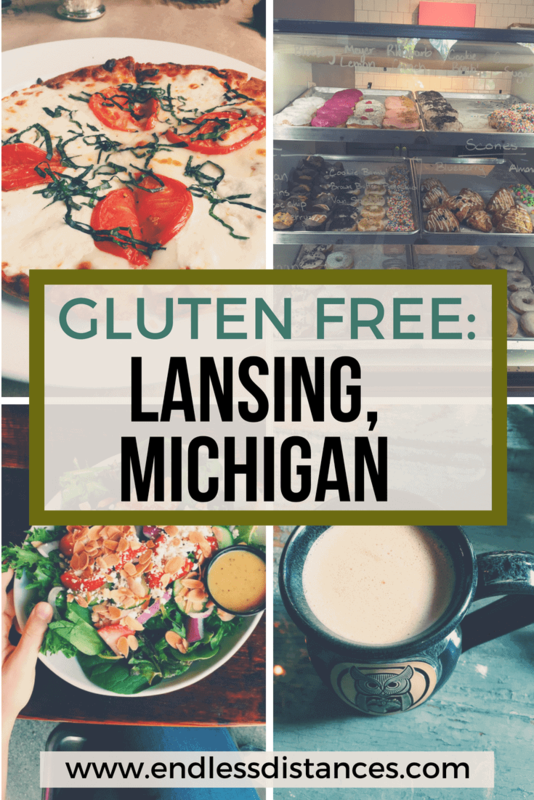 The Lansing gluten free scene may be hard to find at first, but I promise it is there and…. ready for the eating 🙂 Feel free to email or message me with any questions about being gluten free, traveling gluten free, or visiting the Lansing area! *This blog post is in collaboration with the Greater Lansing Tourism & Convention Bureau. My meals at Tavern 109, Envie, Lansing Brewing Co. and Blue Owl were complimentary of the Greater Lansing Tourism & Convention Bureau. Envie was new to me but the other three I was already familiar with and can recommend based on multiple visits! As always, all opinions are my own. Things to Do in Lansing Michigan: Touring my Hometown!